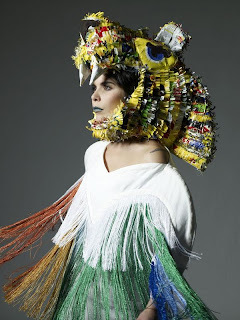 Well when I say "new" I actually came across Paloma about 4 years ago in the dark and dingy basement of 333 when she was still more of a performance artist than a singer. She emerged out of a bath full of feathers and then gave birth to something full of fake blood on stage before unleashing her beautiful voice to sing a song. I instantly fell in love with her then and have been following her career ever since. So of course I got overly excited when I saw her new music video full of familiar East London faces (Russela, Ryan Styles, Amechi & Josh Weller amongst others) for "Stone Cold Sober" being played on TV. She has also made an appearance as an actress in the new "St Trinians" film and was filming a movie with the late Heath Ledger before he sadly passed away. But of course since I'm a fashion hag, what really drew to me to her straight away were her amazing outfits. Miss Faith has already gathered quite an impressive portfolio on her Myspace appearing and modeling for various magazines. Here I've picked out some of my favs. Watch this space! I shot some behind the scenes for T4 Music of Paloma's perfomance on the roof top in Brick Lane and studio last month.....she;s amazing singer and a great stylist!!!! Yes, she does her own styling and the band too.....very talented.